I have Easter stuff randomly throughout the house. I need to get myself organized. My in-laws were in town last week and part of this week. So I’ve been playing catch up and putting the house back in order since they left Tuesday afternoon. We had a great time with them. I am also in the process of switching all my photos over to Apple’s Aperture 3. And for some crazy reason, I thought this would be a great opportunity for me to organize and tag the 22,000 photos I have in our photo library. A bit much. 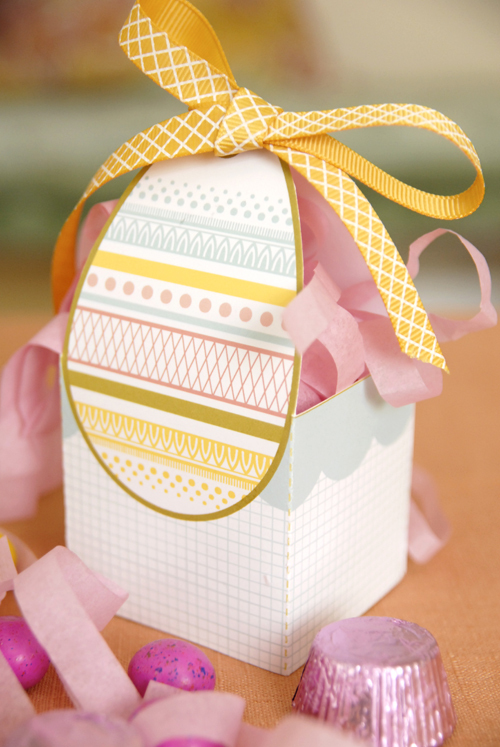 Melissa of IS•LY is a graphic designer and she came up with this adorable Easter basket printable. Great idea for little Easter treats to hand out to the children. Megan of Not Martha has the most impressive Easter egg surprise tutorial. It’s egg shells with chocolate surprises inside. Meg of Elsie Marley has a quick tutorial on a sock bunny made from children’s socks. Most adorable sock bunny I’ve seen in years. And don’t forget about my tutorial for dying and decorating Easter eggs if you haven’t done that yet. Last week’s Friday’s 5 at 5 gave ideas of what to put in that Easter basket this year and an Easter scavenger hunt idea. » Tell me… What do you have planned for Easter this year? Any fun or creative ideas? Aperature 3? I’m so not with the times? What is that? Is it like lightroom? Thanks for featuring my printable! Happy Easter! !